In Virtual-Virtual Reality, a satirical Google Daydream VR game released today, a melting slab of butter orders you to smear toast on his unctuous body. When he demands more toast, 32 toasters appear. Toast is burning, popping out onto the floor. The butter is unhappy; he yells at you to “cover his butter body,” but it’s impossible to rub all of the toast on him in time. “This was only a modicum of indulgence,” butter later writes in his three-star review of your services. “The attendant clearly displayed human deficiency in coordination competence.” When you take off the in-game VR headset, referred to as a “virtual labor access point,” you’re in a sterile, white room and your boss is very disappointed in you. V-VR is a two-hour virtual reality game by Danny Cannizzaro and Samantha Gorman, a developer whose nearly 15 years working with VR uniquely positions her laugh at it. In V-VR, players perform “virtual labor” for the game’s “idiosyncratic” clients, ranging from pinwheels to artichokes. In a future where robots do most human jobs, human labor has become an artisanal service, which the in-game startup Activitude has monetized. 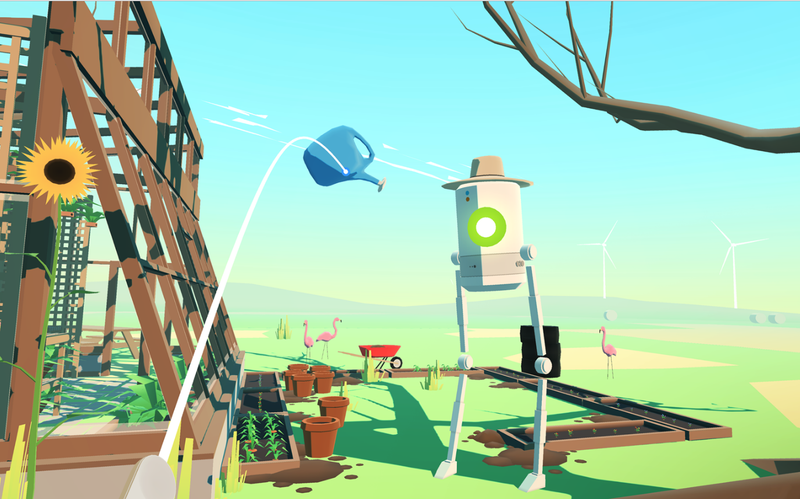 Players access and serve Activitude’s AI clients, like butter, through “virtual labor access points,” in-game VR headsets, which you remove with a full-armed flip of the Google Daydream controller. It’s a game with a lot of layers. The deeper in you go, the more impossible tasks you’re given; and the more “immersed” you get in V-VR ’s virtual service tasks, the more your ratings drop. You feel alienated by the gap between what services you can provide and what’s being asked of you, and, consequently, from the VR technology. That’s when you’re contacted by a human labor union—fitting for when you miss human reality most. Gorman and Cannizzaro’s studio, Tender Claws, is both an artist’s collective and an indie games studio. In 2002, when she started working with early projector-based VR environments, Gorman wasn’t sure VR was headed toward the mass adoption startups are placing chips on today. With V-VR, Gorman wanted to comment on the inflated VR industry, on virtual labor and escapism, and wanted to take full advantage of how humans move in VR to do it. In V-VR, the medium is the subject matter. V-VR nails its mockery of corporate VR and the “immersion” buzzword so well that the only medium capable of conveying its many themes is VR itself. It’s more felt than perceived, a lovingly cheeky response to artists’ early hopes for the medium and the strange, bloated fever dream VR has become.